Aprilia RST1000 Futura | Rear shock - rebuild or replace? You are here: Home › Workshop › Servicing › Rear shock – rebuild or replace? The Aprilia RST1000 Futura comes equipped as standard with a Sachs rear shock adjustable for preload via a knob below the seat on the left of the bike and rebound via a screw adjuster on the bottom of the shock. Though the Sachs unit is not the best money can buy, it’s not at all bad when new, although it can be a little overwhelmed sometimes two up and with luggage. Most riders report that the shock can last a good 30,000 miles, depending on how much weight it has to deal with on a regular basis. When it’s worn it loses its damping. Aprilia say the shock is non-rebuildable and it doesn’t appear that seals are available. From time to time businesses appear on e-bay claiming to do rebuilds but don’t come up with the goods. So far (October 2010) to my knowledge, nobody has successfully rebuilt a Sachs unit and there probably isn’t much point in doing so when there are better aftermarket alternatives available for the price of a rebuild. 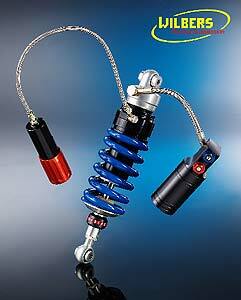 In the UK there are many suspension builders but the two below are known to have made rear shocks for Futura owners. Both are reportedly good quality shocks but you get what you pay for. Hagon Products will do you a Futura shock for around £300 – again, without a remote preload adjuster. Again, this shock has had favourable reviews and is thought to be better than stock, so if you don’t ride like Valentino Rossi (or Meanstrk!) then you might be better off saving your money. Hagon Products are based in Essex. Wilbers apparently make the replacement shock of choice, especially in the US, where plenty of riders swear by them. Wilbers do a direct replacement and an upgrade, which is also adjustable for compression damping. Many US riders report that the Wilbers shock is a big improvement on the original. However, for UK (and maybe Eurozone) riders, the Maxton shock works out a lot cheaper. A couple of riders in the US have adapted Ohlins rear suspension units from an early Mille-R. It requires a competent (and confident!) mechanic, because you need to adapt the linkages, but it works and is a big improvement. Or download The Fixer’s Ohlins installation guide in PDF format.